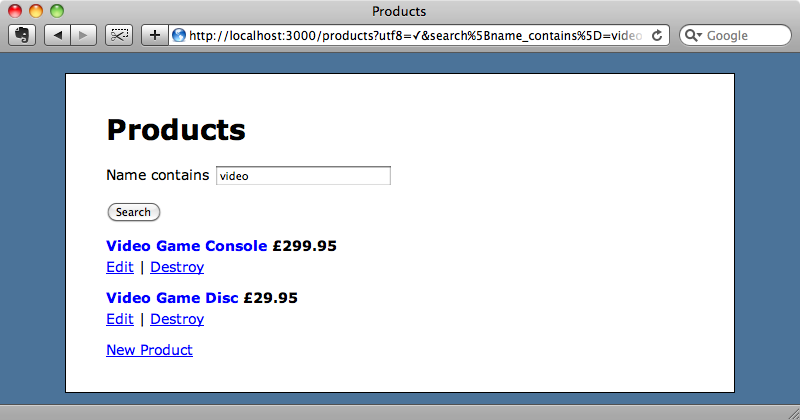 Below is a screenshot from a simple Rails 3 application that displays a list of products. The page has a search form that will filter the products by their name. 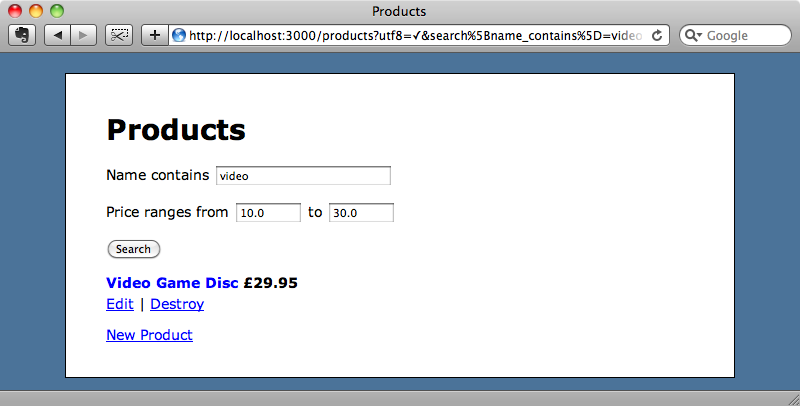 The code uses the where method with a SQL snippet to find all of the products whose name is LIKE the search term. As the search condition is more complex than a simple equals we can’t pass in a conditions hash and the same would apply if we were doing a less or greater than comparison. ActiveRecord requires SQL strings for all of these. With MetaWhere we can remove the need to use SQL fragments in queries and use hash conditions instead. This approach is similar to how DataMapper and Mongoid work and it’s nice to have it as an option in ActiveRecord. To see how easy MetaWhere is to use we’re going to modify our products application to use it. First we’ll need to add a reference to the gem in the application’s Gemfile. # Edit this Gemfile to bundle your application's dependencies. We’ll need to run the bundle command to make sure that the gem is installed. Once it is we can modify the search code in the ProductsController and remove the SQL fragment. With this simple change in place the application will behave as it did before and the same results will be returned for a given search. Next we’ll show some more complex examples in the console. For example we’ll get all of the products whose price is less than five pounds. We can also add OR conditions by using multiple hashes separated by the pipe symbol. The search below shows us all of the products that cost less than five pounds or which have the word “video” in their title. MetaWhere also gives us some useful additions to the order method. If we want to order products by their released_at date to show us the most recently released products first we can do so with the following code. This gives us a more convenient way to define search conditions. There is much more that can be done with the MetaWhere gem and there are it’s well worth reading the documentation to find out more. For the rest of this episode we’ll take a look at another gem by the same author: MetaSearch. This gem adds a convenient way to perform searches on a model through a form. With it we can call search on a model, and pass in search parameters from the form. We can then fetch the records that match that given query. An example of this is shown below. In the view code the name of each field defines the search functionality. A text field in the form called title_contains, for example, will mean that the search will search for records whose title contains the value entered into that text field. Let’s give this a try in our application by replacing our current search form with one that uses MetaSearch. The first step, as it was with MetaWhere, is to add a reference to the gem in the Gemfile. We create the search by calling Product.search, passing in the parameters from the form. Then we call @search.all to get a list of the matching products. This will fetch the products using an SQL query immediately, if we want to add additional conditions to the query afterwards we can user relation instead of all which will return a scope. If we needed pagination we could use paginate but in this case all will do what we need. In the index template we need to update the search form to use the field names that MetaSearch requires. The form currently uses form_tag, but we’ll need to use form_for instead with the search object. We want to search for products whose name contains the search term and so the text field on the form needs to be called name_contains. If we reload the products page now we’ll see the new form and if we search for the same term we did before we’ll get the same results. Reloading the page again will show the two new fields. We can now search for items by price range or by both name and price, so if we search for products with a name containing “video” that cost between ten and thirty pounds we’ll get the one matching product returned. The key here is in the names given to the form fields as these determine the search conditions. There are more options that can be used in the form fields and these are covered by the documentation. 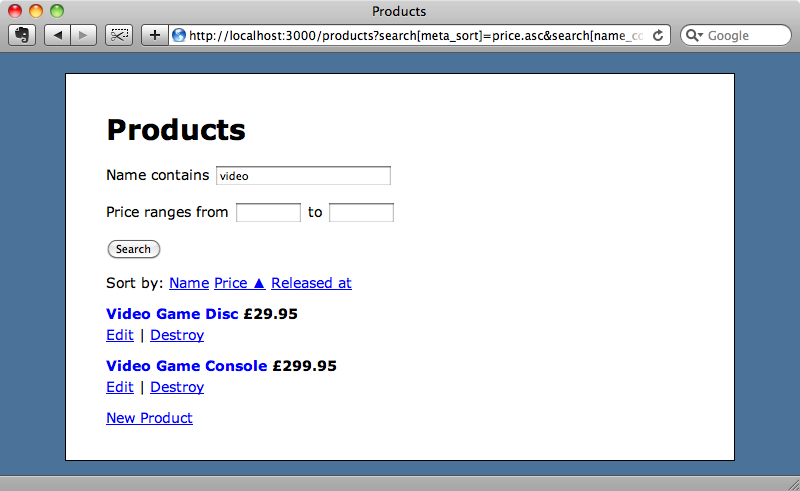 When we reload the page now we’ll see the links and we can sort the products by clicking one of them. We can also combine the sorting with a filter. One thing to be aware of when using MetaSearch is that it opens up our database tables to be searchable by any of their columns, simply by altering the form before it’s submitted. This also applies to associations so if we have associated records that contain sensitive data then we’ll need to be aware of this when using MetaSearch. To help with this problem there are some security methods that we can add to our models to limit the fields that can be searched against. We won’t go into details about this here but there are details about this on the MetaSearch website. If you’re using MetaSearch on a public-facing website then you’ll definitely want to implement this. That’s it for our look at MetaWhere and MetaSearch. There is another gem that provides similar functionality called Searchlogic, but this doesn’t work with Rails 3. If you like the behaviour of Searchlogic, but want a solution that works in Rails 3 then MetaWhere and MetaSearch are definitely worth a look.